Carmen of Earths Raw Beauty has been soaping for less than a year, but you would never know it by the number of techniques she has mastered. 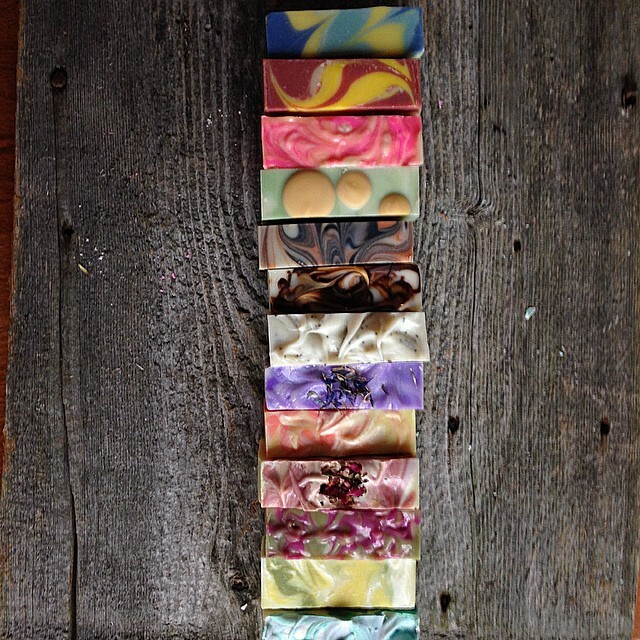 I first stumbled on her colorful soap on the #SoapShare tag on Instagram, and was in awe of her abilities. 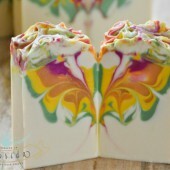 Each soapy design showcases a different technique, whether it be her precise layers, perfect rainbow hues or skillful swirls. If there is one consistent factor in Carmen’s soap of Earths Raw Beauty, it is that each each bar is completely distinct. 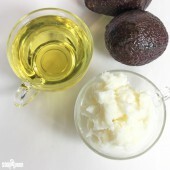 Read on to find out more about Carmen, including how she got started soaping and her unique method of using goat milk. 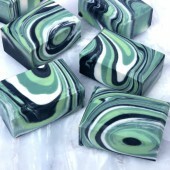 -A.M.
Carmen’s beautiful Spectrum Bits Cold Process Soap, scented with bergamot and white tea. I’ve been soaping for 7 months now. To be more precise it’s been 7 months and 2 weeks and I’m looking forward to many, many more. Every time I get asked this question I answer “Texas did it to me!” and it’s true! I was in Texas for a week at the end of July last year and I swear, there was something in the air. 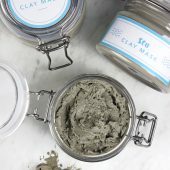 I actually started off by making skin care products in March of last year. Soap was never on my mind. While in Texas, during my very first day, I found myself watching soap making videos. Don’t ask me how I started watching them because I seriously have no idea. 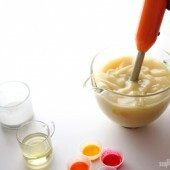 I just remember being fascinated by the action of a stick blender going through the melted oils and lye solution. Even now I could watch someone stick blend soap for 10-15 minutes. 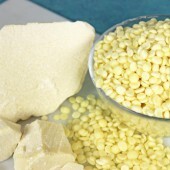 Most soap makers started because they wanted a natural solution, or they wanted to give homemade gifts. 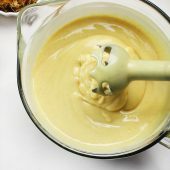 I started because I was fascinated by a stick blender in action. Little did I know that the stick blender was only the beginning of the magic. I spent that entire week in the hotel room reading and watching videos about soap making. 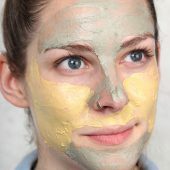 I watched all the Soaping101 and Soap Queen TV videos, and I read as much as I could. Then I ordered a silicone mold and lye from Amazon because I wanted to make sure I had them in my mail box when I got home. I got home on July 31st (yes, I remember because it’s the first day I ever made soap) at 7 p.m., and as soon as I got home I made my very first batch of soap. 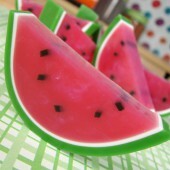 It was all it took for me to fall in love with soap, especially after I cut the first slice. I’ve been hooked since. When it comes to business I can’t really give any advice, I have a lot to learn in that department. It’s been less than 8 months since I made my first batch, therefore I didn’t start selling until 2 months ago. For now I sell on Etsy, and of course to my friend’s friends and their friends, the word of mouth spreads really fast. Now this is a very easy question. 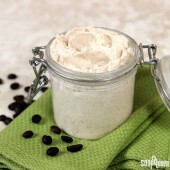 I make all kinds of skin care products: salves, butters, balms, creams, lotions, scrubs, bath bombs (my worst enemy), etc. 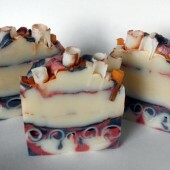 By far, cold process soap is my favorite product to make. 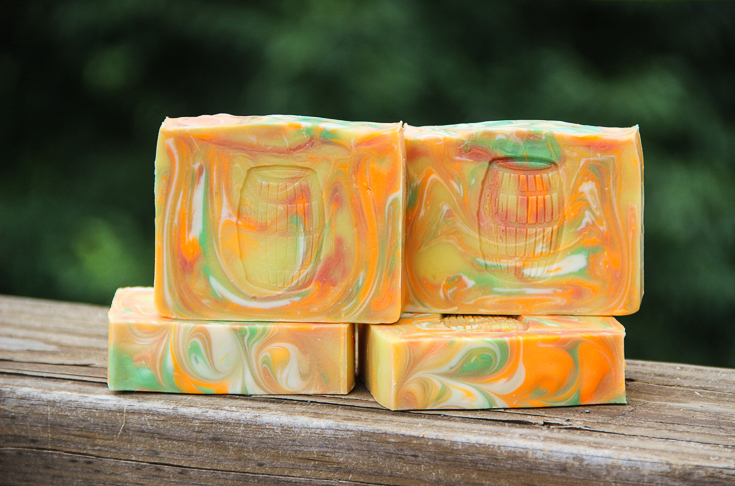 I have been a longtime fan of Single Barrel Soaps. 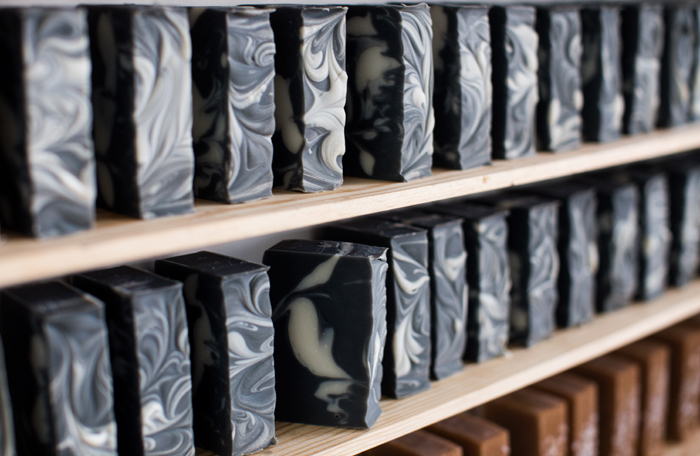 Made by Lauren, Single Barrel Soaps are instantly recognizable from the cute barrel stamp in the center of each bar. 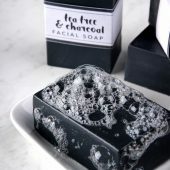 This clever marketing technique really helps set Lauren’s amazing soaps apart! 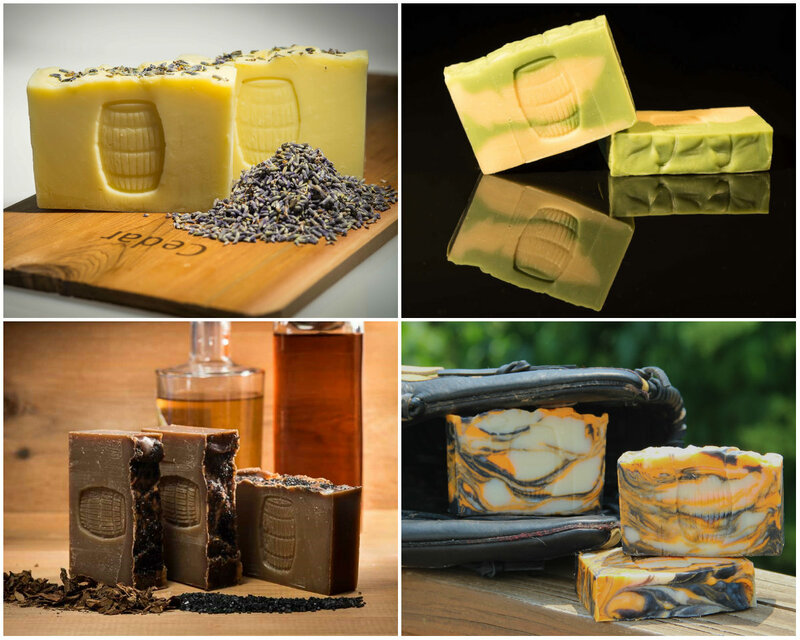 In addition, Single Barrel Soaps’ work is full of different techniques and eye-catching designs. Keep reading to learn more about Lauren’s branding, creative process and how she started soaping. -A.M. 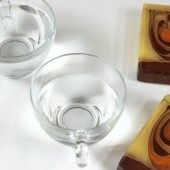 Single Barrel Soaps’ Shea & Cocoa Butter Soap, scented with Energy Fragrance Oil. 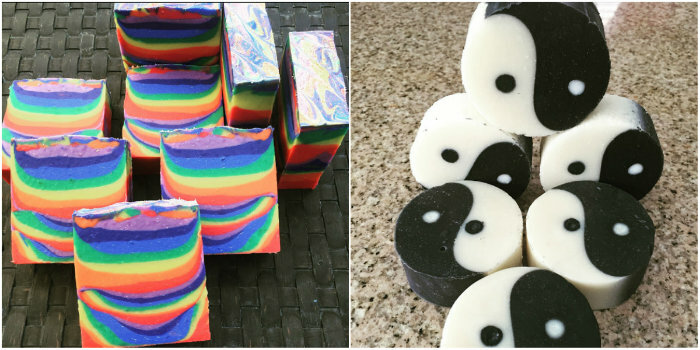 Bubble baths and handcrafted soaps have always been my area to splurge on. 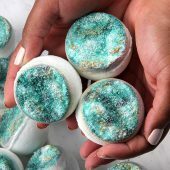 After having two kids, I figured a great way to save money would be to try to make my own bath fizzes and soap, and since then I have been hooked! 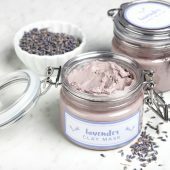 I did tons of research online, bought books, read blogs (SoapQueen.com), watched videos and started making bath products and melt and pour soap. 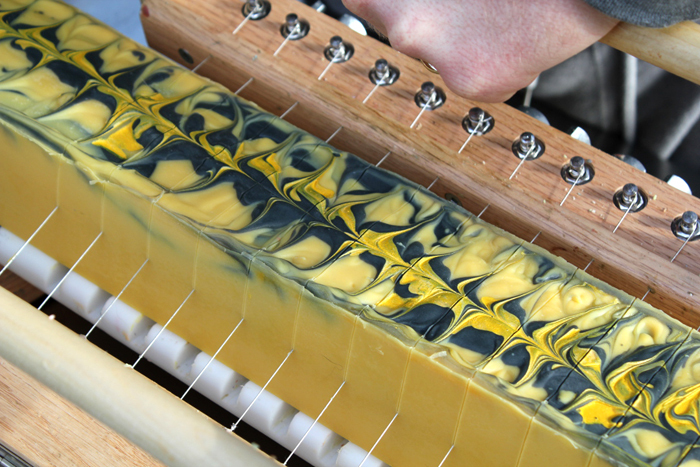 At first I was really intimidated by cold process soap and the ever scary lye! But I quickly got over that fear and I haven’t looked back since! 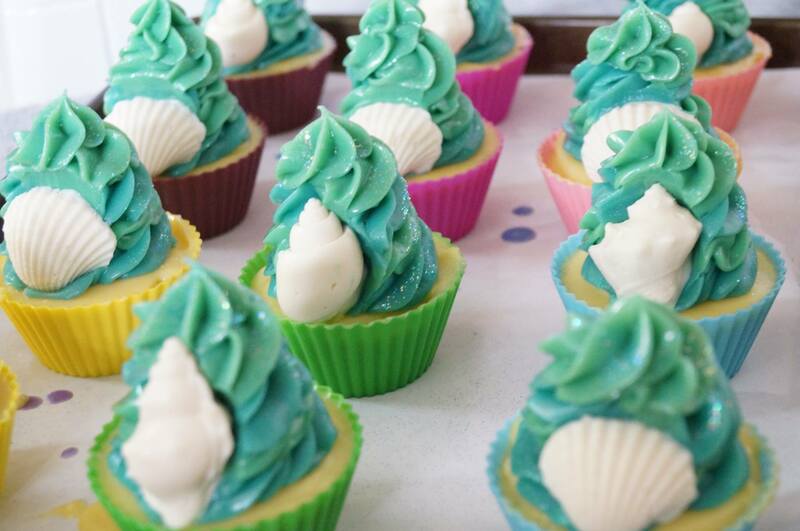 Last Christmas I made tons of soaps, bath truffles and candles as presents for my family and friends. 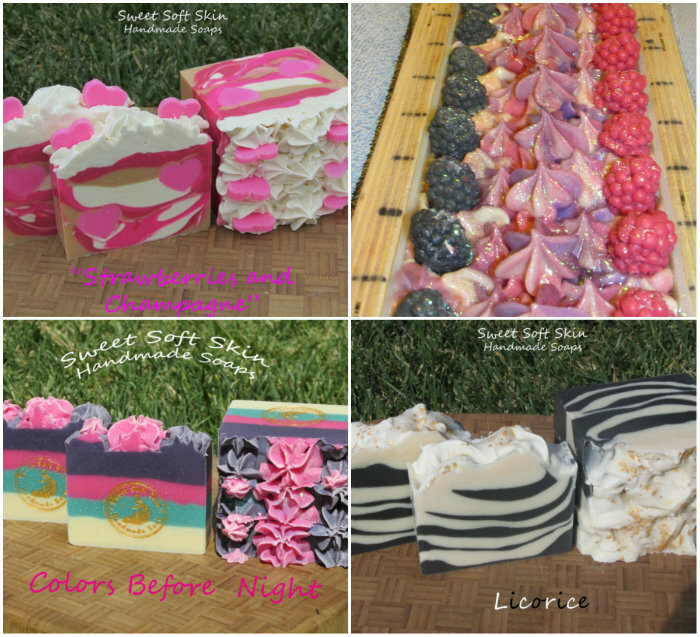 There was such an amazingly positive reaction from them that I had enough confidence and support to start Single Barrel Soaps, LLC in the beginning of this year. 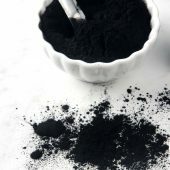 This can be a really hard business to start, and be successful in, since we have to make our products so far ahead of time and pay for our supplies upfront. So, take a good look at where you want your business to go and take the time to write a business plan. For all the creative people out there this can be a very hard thing to do (speaking from personal experience). However, in the long run, it really gives you a blueprint to work from and be successful. Also, keep really good records of all of your expenses because they can add up very quickly! I truly believe if you love and are enthusiastic about what you do, it will show in your overall business and people will be drawn to your products. 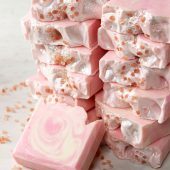 Linda O’Sullivan (also known as Mimi and Boo) creates stunning cold process soap and bath fizzies in the UK. 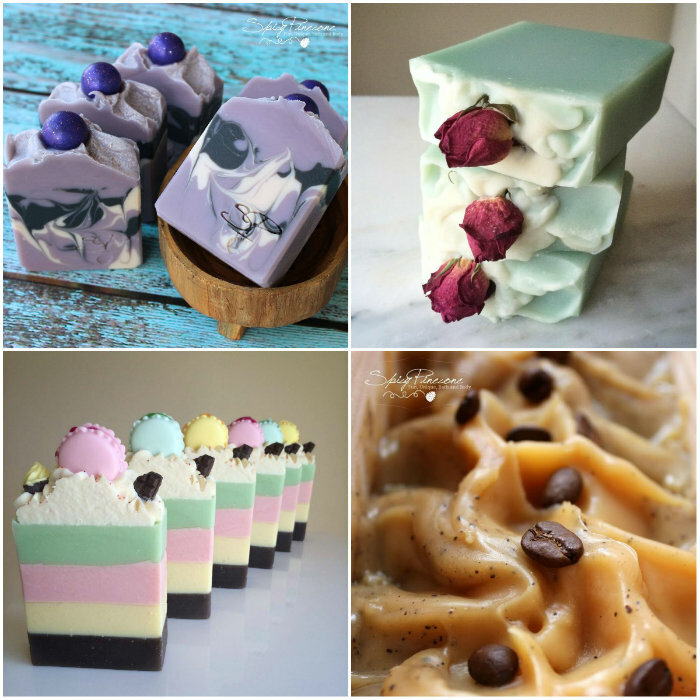 I first came across her soaps on Instagram, via the hashtag #SoapShare. I quickly found myself scrolling through her dreamy Instagram feed, feeling incredibly inspired. All of Linda’s creations are elegant and sophisticated. 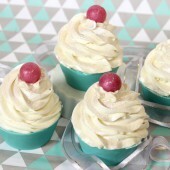 I love how each look so creamy and decadent! Read more about Linda, her creative process and photography tips in the interview below! 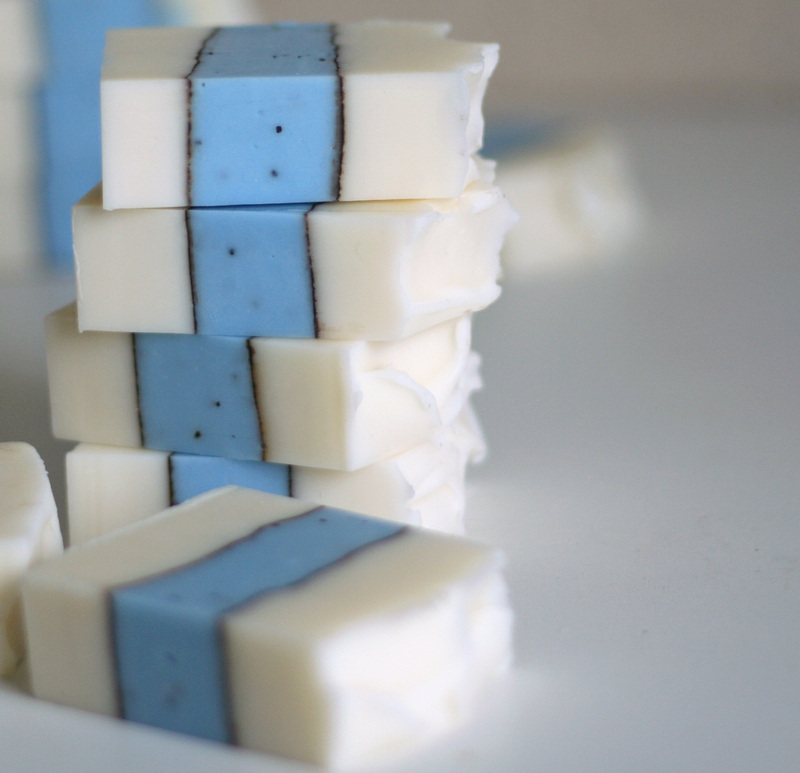 -A.M.
Linda’s beautiful peppermint cold process soap. 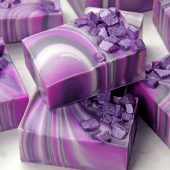 I came across a soap making book back in 2000 and decided to give it a go. So I made my first batch and I’ve basically never stopped. 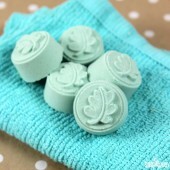 It was very much a hobby at first and I gave away my soaps to friends and family as gifts. When my son started school in 2009, I realized that I wanted to be at home for him. I wanted to be at the school gates, I wanted to be there when he did his homework… I worked in broadcasting at the time, with a long commute and some traveling to faraway places. 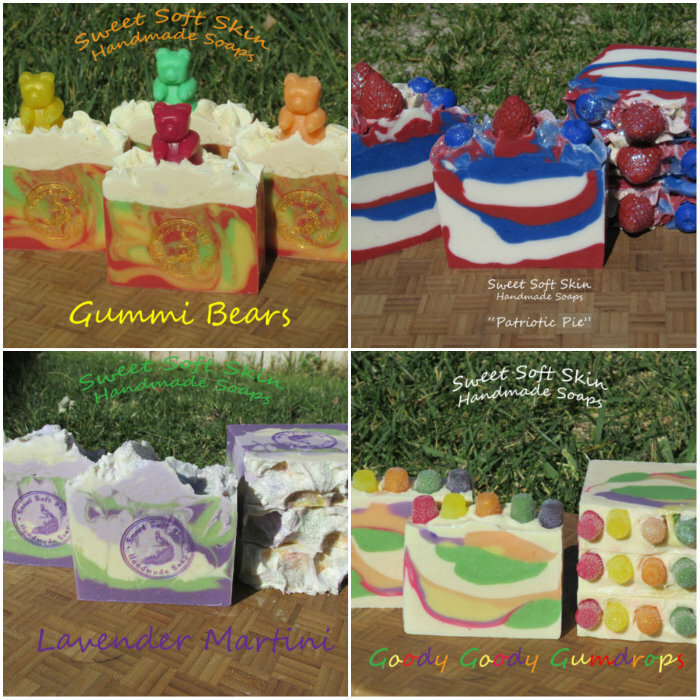 So I gave up my job and set about starting my own business making and selling handmade soaps. It turned out to be the best decision for me and my family. Well, what works for me is that I love what I do. Even when I work long hours it never feels like work and that keeps me going. To those starting their businesses I would say: Believe in what you do and go for it. You will make mistakes along the way. We all do but we can learn from them. And try to find the balance between being artistic and being consistent. When you’re running a business it is important be able to recreate the exact same product time and time again. 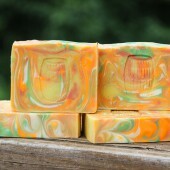 I have many repeat customers who keep coming back to buy the same soap. This means keeping meticulous notes all the time. 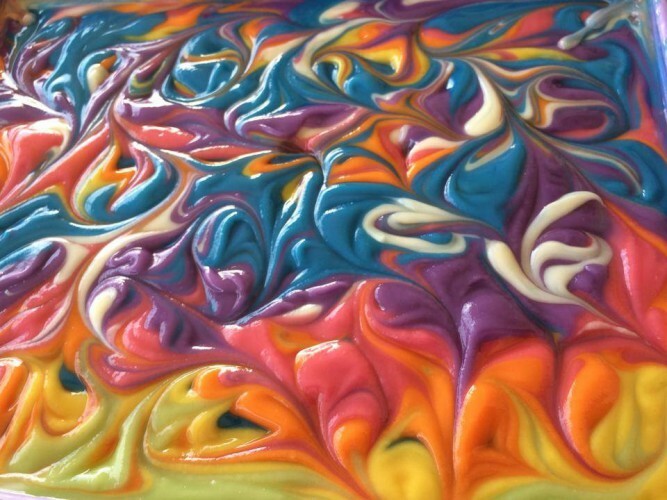 Marcela of Majestic Bliss Soaps creates gorgeous cold process soap with lots of color and intense swirls. 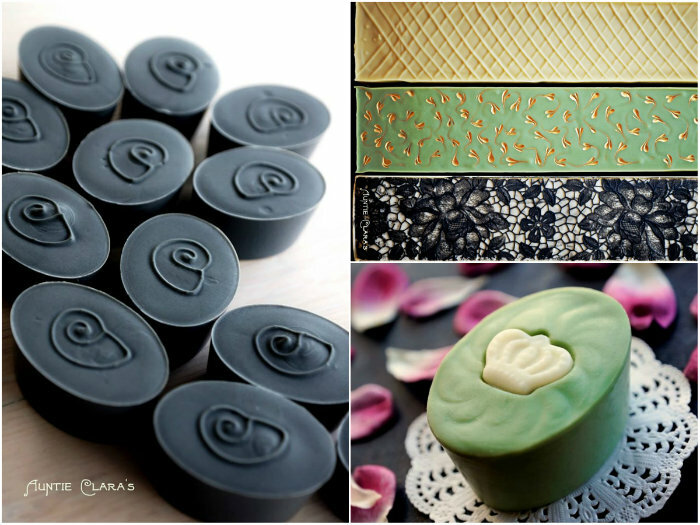 Marcela’s soaps are not only beautiful, they also make a difference around the world. 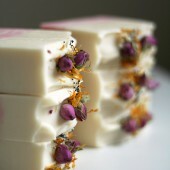 Every month a portion of the proceeds from Majestic Bliss Soaps are donated to world-recognized charity organizations. 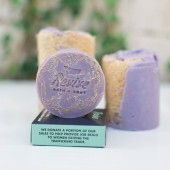 In addition to beautiful soap for people, Majestic Bliss Soaps also creates FUR PAWS, a line of soap created for canines. 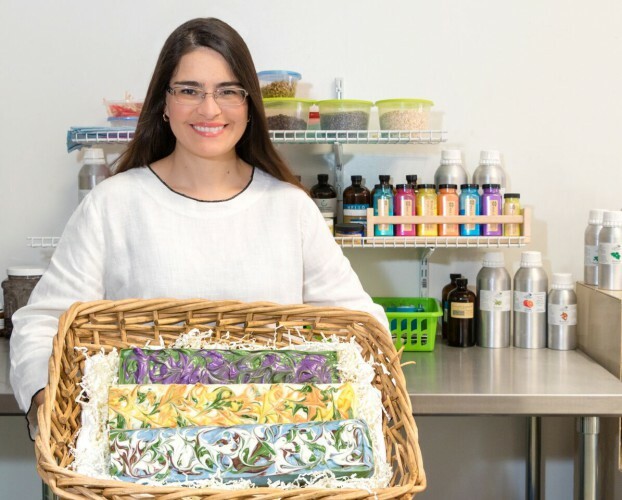 Read on to learn more about Majestic Bliss Soaps, including Marcela’s tips for selling wholesale and giving back to charity. -A.M.
I’ve been happily soaping since April of 2014. Majestic Bliss Soaps was created to help my clients extend their bliss beyond a therapeutic session. As a bonus, we saw the opportunity to extend assistance to organizations that help humans and animals thrive. 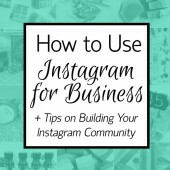 One of the best things about social media is being able to connect with fellow crafters from around the world. 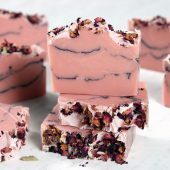 I started the hashtag #SoapShare to help connect soapers, and of course to browse through all the beautiful photos. 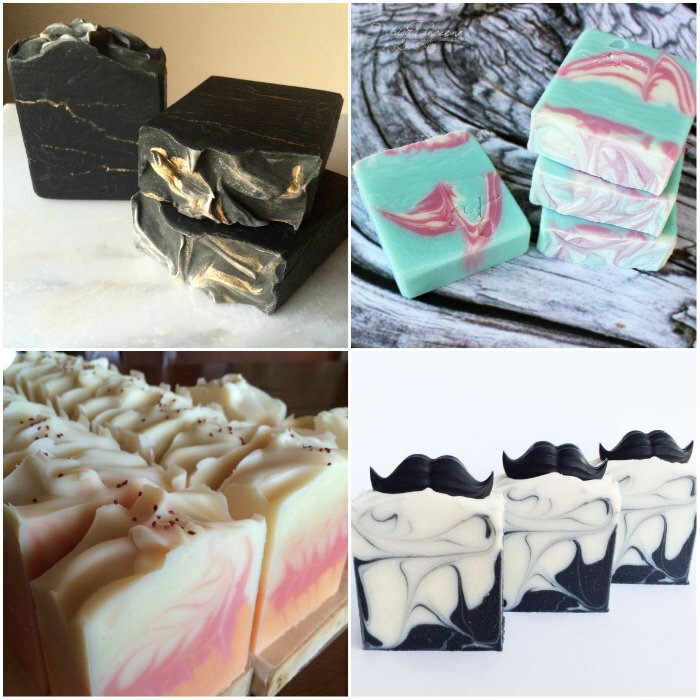 While looking through photos tagged with #SoapShare on Instagram, I stumbled upon Carolyn of Siennalily Soaps. I was blown away by the gorgeous designs created by Carolyn, who lives in Spain. Read my interview with Carolyn below to learn more about this talented soaper! 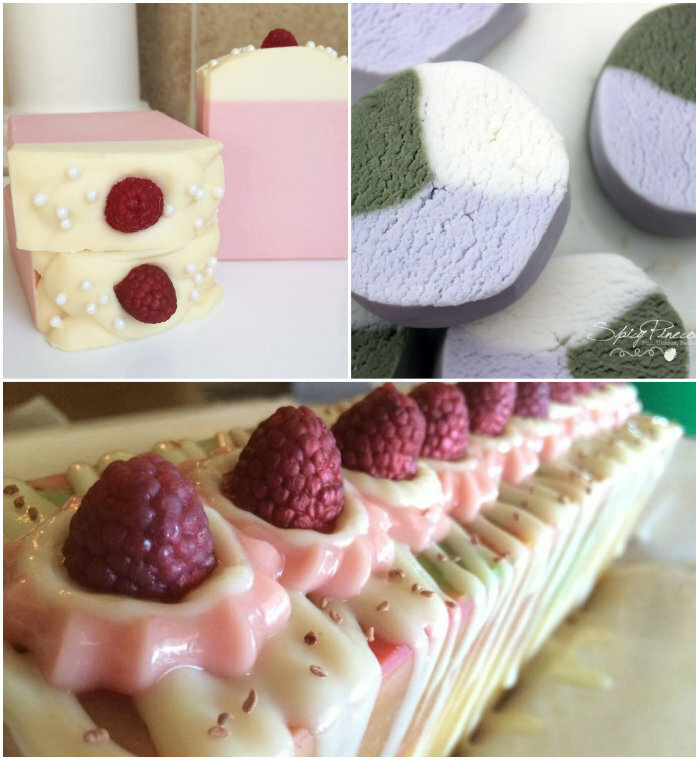 – A.M.
Siennalily Soaps’ show stopping Rio Cold Process Soap. The drop swirl looks amazing! I started about 7 months ago. I decided I wanted to try something different and wanted to make something special for my 4 daughters as a little stocking filler that meant something to us all for Christmas. 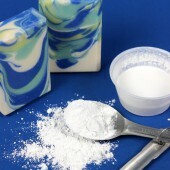 I looked into soap making and got a little anxious when I read about the lye solution, but I didn’t let it stop me. Next thing was finding supplies! 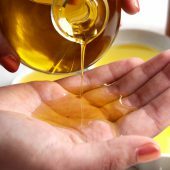 I live in Spain, and the only thing I could buy here were my oils and sodium hydroxide, no fragrance and no colours. So, I hit the internet to find everything. While I was waiting and itching to get started, I found YouTube videos about soap making and watched them in every spare minute I had. 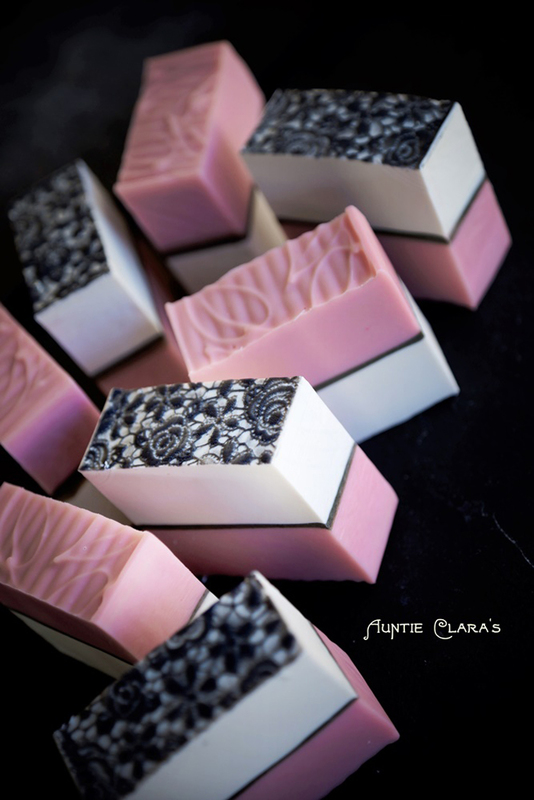 All the lovely soap makers around the world helped me immensely, especially Anne-Marie (The Soap Queen). I loved watching all of the videos to gain knowledge before I started. 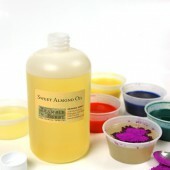 I was intrigued by all of the intricate swirling and pouring techniques and thought to myself, “I will never be able to do that in a million years!” It took about 10 days for my supplies to start arriving. 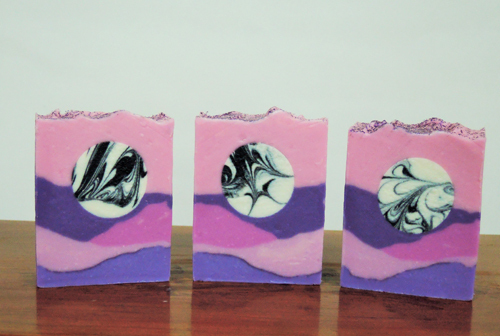 My first soap was pink, green and white and fragranced with an apple scent. It is ugly and smells awful but I was overjoyed with that soap. Everyone got the photo sent to them. 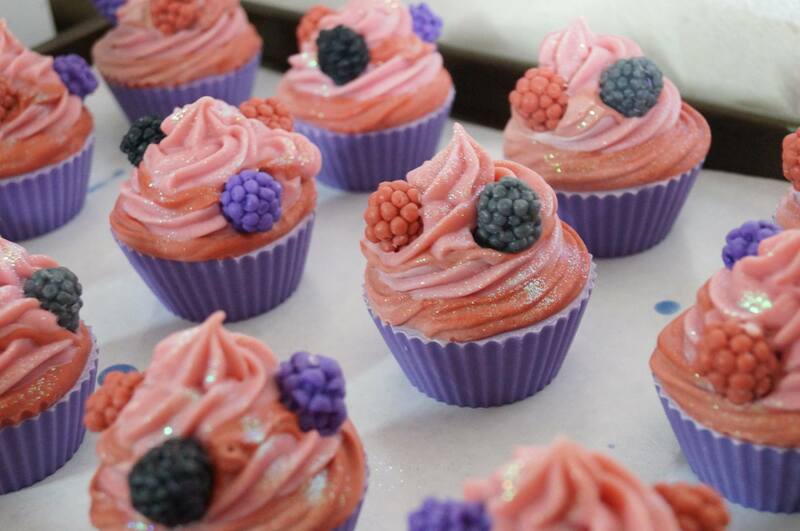 With my first soap under my belt I gained confidence and on 11th October 2014, Siennalily Soaps was born. Margaret of Sweet Soft Skin Handmade Soaps creates gorgeous soap that is full of color and personality. 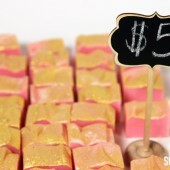 Her signature style are bars with plenty of layers, soap frosting, embeds and glitter. The result is showstopping! 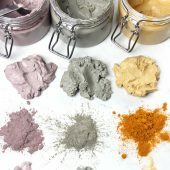 Read on to learn more about Margaret, including what inspires her color palettes and her number one soaping tip! -A.M.
Margaret’s adorable berry soap cupcakes. Margaret is known for her use of embeds, glitter and lots of color. I started soaping two and a half years ago. I was gifted some nice soap from my brother-in-law for my birthday and looked up how soap was made. It sounded like a cool process and something that would be fun to do with my homeschooled children to illustrate the usefulness and marvels of chemistry. We all made a batch as a family (my husband helped too) and I was hooked! 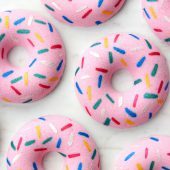 I think the most important thing when you are starting to turn your soaping into a business is to be patient and set small goals for yourself. I already had some experience with a (failed) etsy store before, so I was under no illusions that it would be easy. My first goal was just to get some of the soap out of my house so that I would have room to make more! 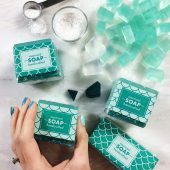 The Soap Queen blog helped me think about further goals and motivated me to keep taking small steps towards turning my interest in making soap into a little business. Each time you meet a goal is a good opportunity to chart where you want to go next. 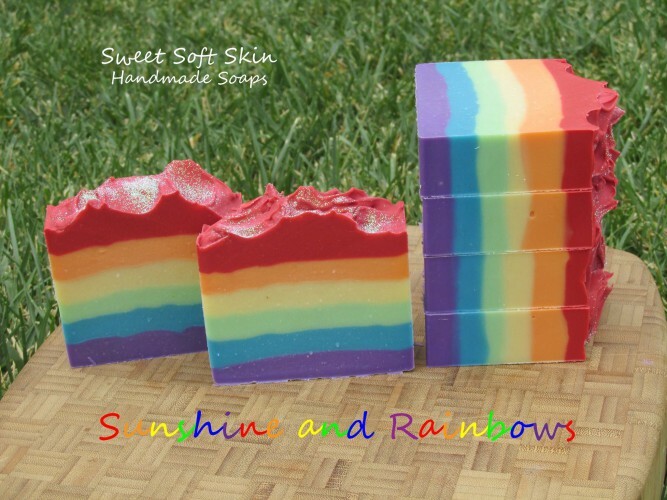 Beautiful Sunshine and Rainbows Cold Process Soap. I love the sparkle on top! 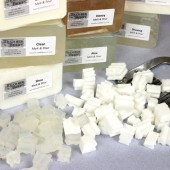 Cold Process soap is my one true love! 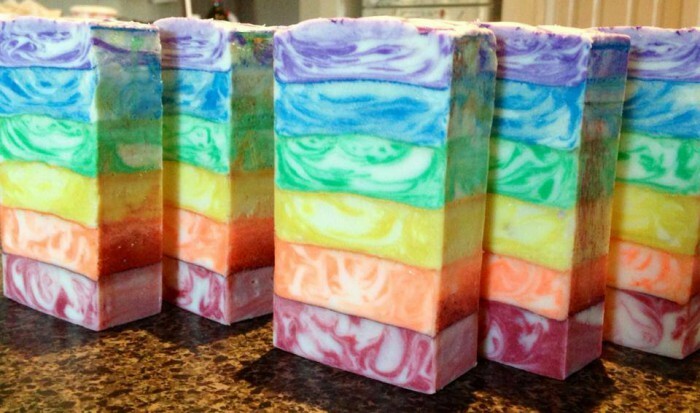 I’ve made bubble bars, lip balms, and even bath bombs as well; but nothing beats the satisfaction of pouring a loaf of cold process soap. 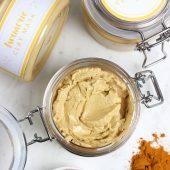 I make lip balms because it is really simple and why not make it when it is something you need, but everything else while neat to try seems like work and soaping is like play. 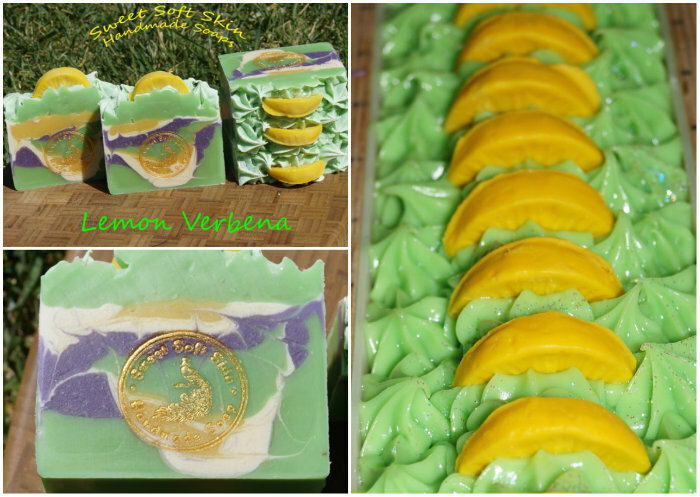 Margaret’s Lemon Verbena Soap Bars. Her stamp looks phenomenal! My sister-in-law Rosie is my inspiration. She taught me to quilt, she made costumes for my daughters so they could be whatever they wanted every Halloween, and she was the first fan of my soap. 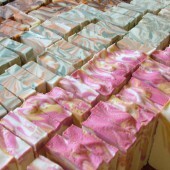 I had made soaps to be Christmas presents for family when I first started making soap. When it became clear that the cancer we thought she was beating was going to claim her before then she got her soap early and how much she loved it really meant a lot to me. I think of her every time I do anything creative. She was a sparkling, happy, creative person who is my inspiration in all things handmade. The peacock in my logo is for her. The peacock is a symbol of the resurrection. Oh gosh, names are the worst! I’ve always liked to write and compose stories to myself in my head, but any time I put pen to paper I always get stuck on the names. My mind totally blanks and nothing sounds right. It’s total agony. I bounced many ideas around in my head (and wrote them out) for days. I wanted something that rolled off the tongue but was not too goofy. Sweet Soft Skin was the first thing I came up with that didn’t make me unhappy so I chose it and stuck with it glad to have the naming challenge behind me. 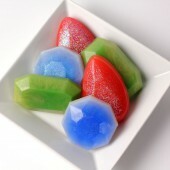 You have such vibrant and colorful soaps. 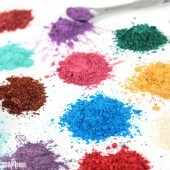 Where do you find inspiration for your color palettes? Back when I was first married I really like quilting. Going into a fabric store and seeing all the colors, choosing a bunch and coming home and making something bright and cheerful so I could feel surrounded by beauty really made me happy. A quilt takes many hours of work to make, however, and after a few years my linen cupboards where full and there was not as much time available to me. 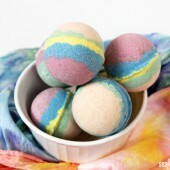 I missed all the vibrance of those colors and when I found soaping it all came back to me. 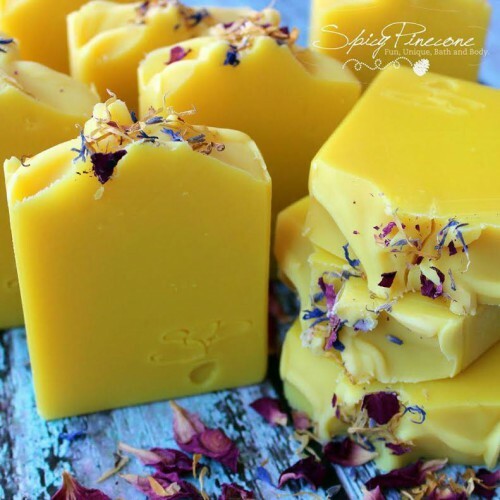 I can whip together a gorgeous soap in 1 to 2 hours and in addition to gorgeous colors I get aromatherapy from working with various scents and get to keep and use something that is beautiful and useful afterwards. What is not to love? 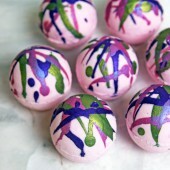 The top of your soap often features fun frosting, embeds and sparkle. 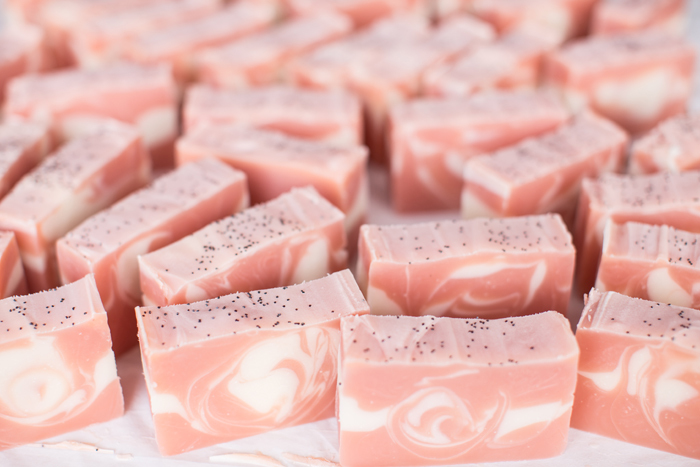 What’s your favorite soapy topping? My favorite embeds are the seasonal shapes like snowflakes, pumpkins, butterflies, and seashells. It is really fun to get psyched for the upcoming season and bringing to mind all the things you love about it. I am also inspired by the pastry arts. My mom would let us play with frosting as kids. She’d give us a piping bag and cookie sheets and let us try out making different shapes and designs. Blending these different things together is just fun and I love them all! 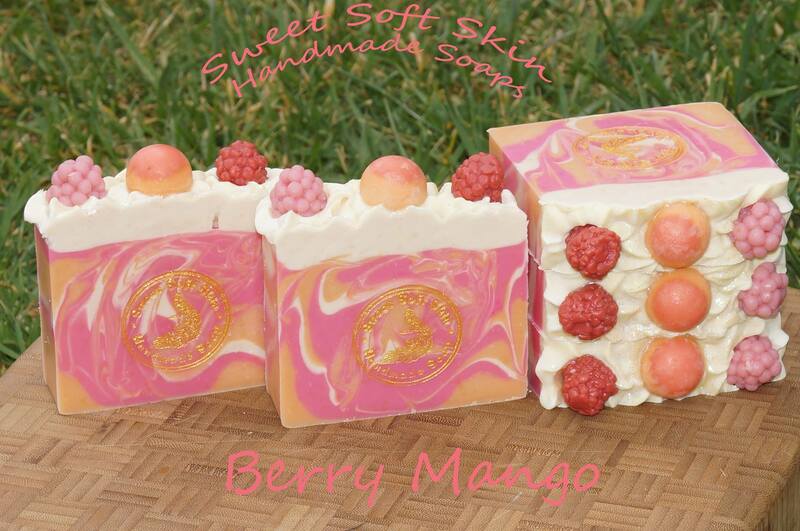 Sweet Soft Skin Handmade Soap’s beautiful Berry Mango Cold Process Soap. Do I have to pick just one? There are so many! Your Cherry Almond Fragrance is a bestseller for me. The Champagne Fragrance Oil is my favorite blender. It goes with anything and really brightens it up. I love your 5 lb mold and liners, your spatulas, so many things! 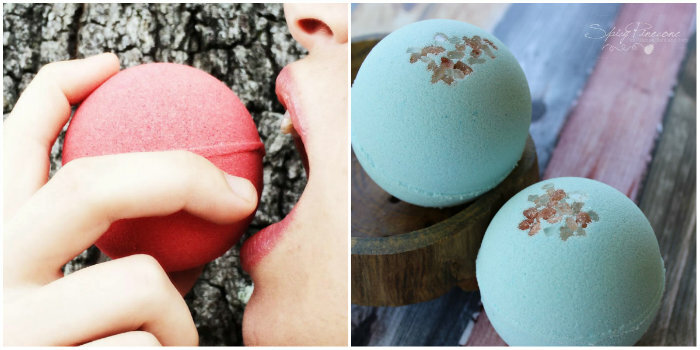 You guys offer a great variety of wonderful items and then there is also the Soap Queen blog which is such a source of support and inspiration. I have red hair and freckles, but I am one quarter Mexican. I speak fluent Spanish because I grew up in Puerto Rico and my schooling from pre K through High School was all in that language. I always get a kick out of the reactions I get when I speak to people and they are shocked by that. I grew up in a Hispanic culture and really feel like a part of it even though I don’t look it at all. I am an avid reader. I read all kinds of books and get through 5-8 in a month unless I get caught up in something like “Brother’s Karamazov.” I also like to make beeswax candles for myself and family members, quilting, and baking. 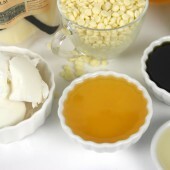 Start out with small batches so that you can make lots of soap without it taking up all your space! 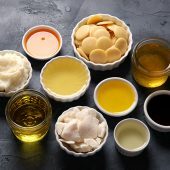 This way you can try those new techniques and fragrances you just have to try without all the guilt. 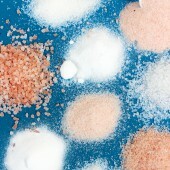 A good scale is very important when working with smaller batches though, so make sure you have one. 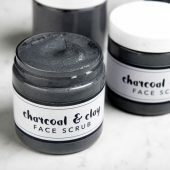 A big part of learning your art is to practice, and you don’t want to sell soap until you have a real grasp on how it all works, so small batches let you practice, practice, practice. I don’t know of anyone who doesn’t experience a soapy fail at one time or another. I find that for me it usually happens when I am feeling confident, but rushed. 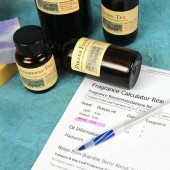 When I think I can handle and accelerating fragrance, or don’t look up a new fragrance because I think I remember how the reviewers said it behaves, that is when my small carelessness causes problems. The important thing is to stay calm! 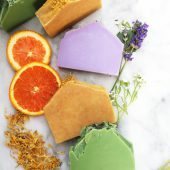 Small disasters like soap on a stick or acceleration that means your design won’t happen are distressing, but if you don’t panic you can improvise and even plop and glop soaps are perfectly useable even if they don’t embody your original vision. I love that you end up with beautiful, great smelling, and extremely useful things at the end of the process. The combination of use and beauty delights me. 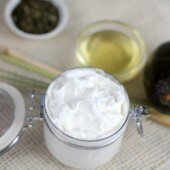 Getting to use beautiful things is so pampering, a small every day luxury that is accessible to anyone! Plus they are so fun to create. 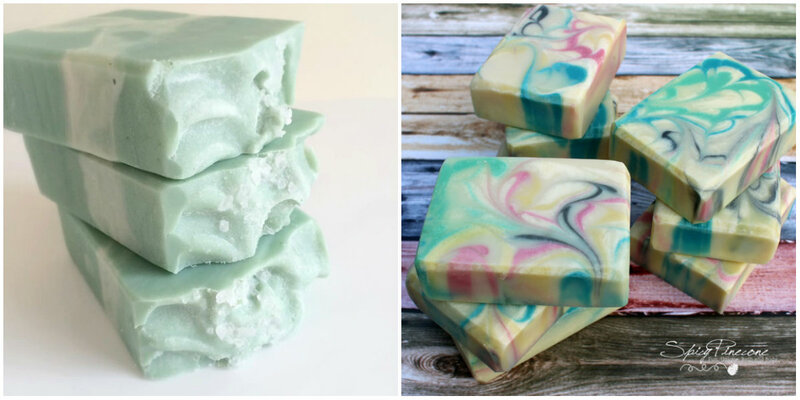 Kangaroo Apple Soap Studio creates colorful cold process soaps that showcase what an artform soapmaking is. 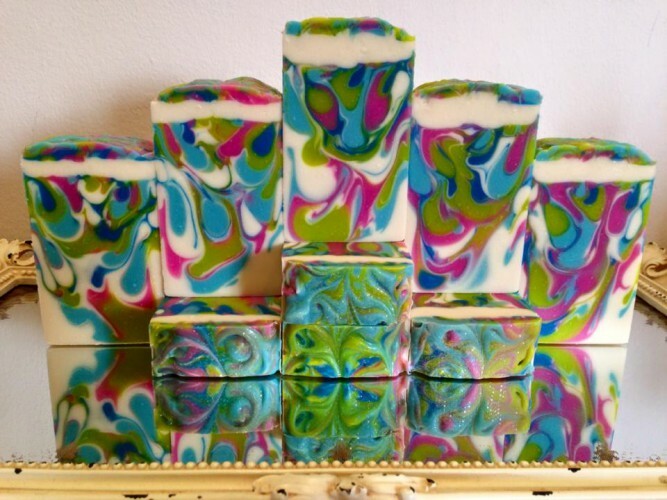 Several months ago, the talented proprieter Lisa won the Facebook Photo of the Week contest with an intricate swirl cold process soap. After looking at her soap, I immediately wanted to know more. 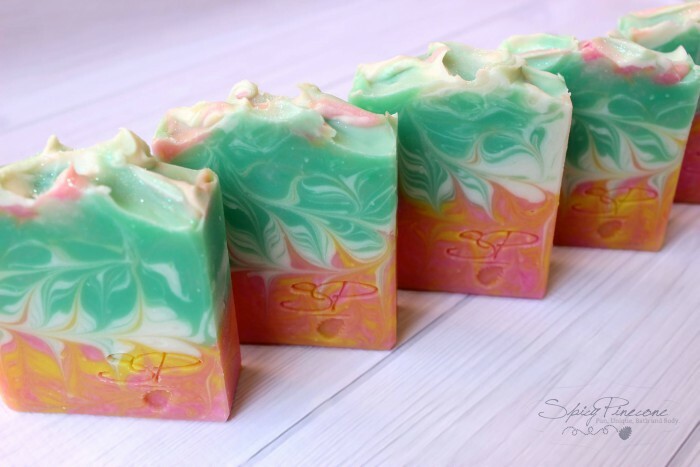 Lisa’s passion for soap shines with a masterful use of color and swirls. Read on to learn more about Kangaroo Apple Soap Studio, including how she came up with her unique business name and where she finds color inspiration. -A.M.
Lisa’s Misty Rainbow Soap created for the in-the-pot swirl Great Cakes Soap Challenge. 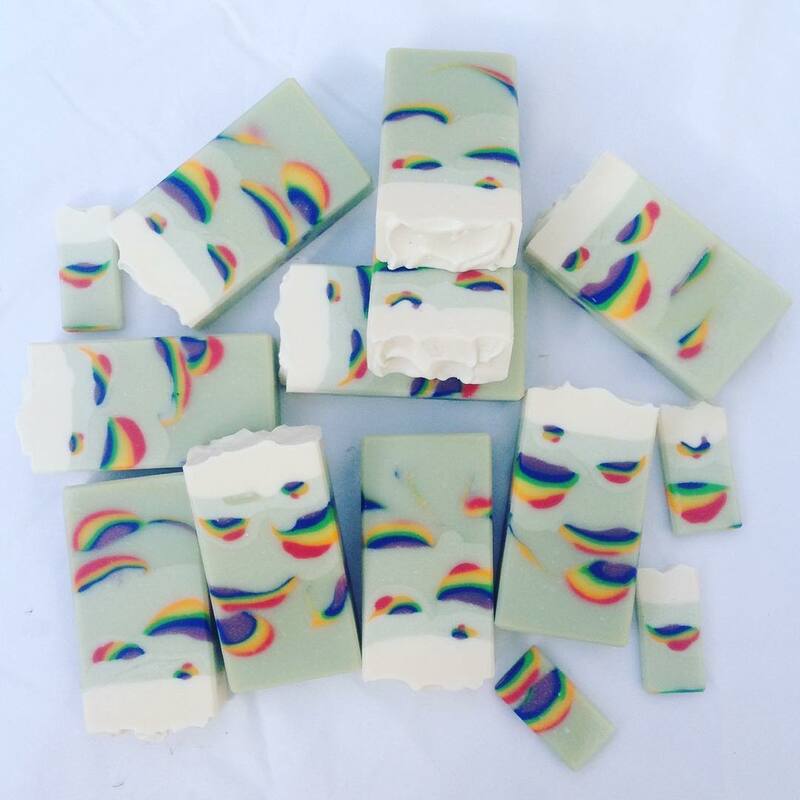 I have been making soap for about 4 years. I have always had an artistic streak but few opportunities to put it into practice, and I was feeling a bit rebellious one year about the Christmas retail ‘machine,’ so I decided to do my own thing. 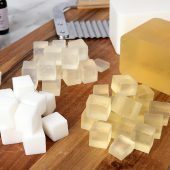 As I was browsing online bookstores for candle-making guides, there was a suggestion that I may also like ‘The Complete Idiot’s Guide to Making Natural Soaps’ by Sally Trew and Zonella Gould. Well, I bought the book, and I was promptly so enamoured with making soap that the candle idea went on the back-burner for quite a while (no pun intended). 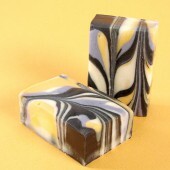 Kevin of Devinely Designed creates beautiful soap and shares his creations via his YouTube channel, Devinely Designed. 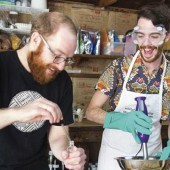 With over 100 videos, Kevin has made a name for himself in the community for providing creative and educational soap making videos. 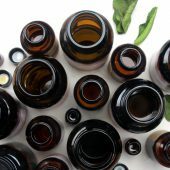 From a Dandelion Zebra Swirl Tutorial to his first experience making liquid soap, Kevin’s videos are fun and thoughtful. 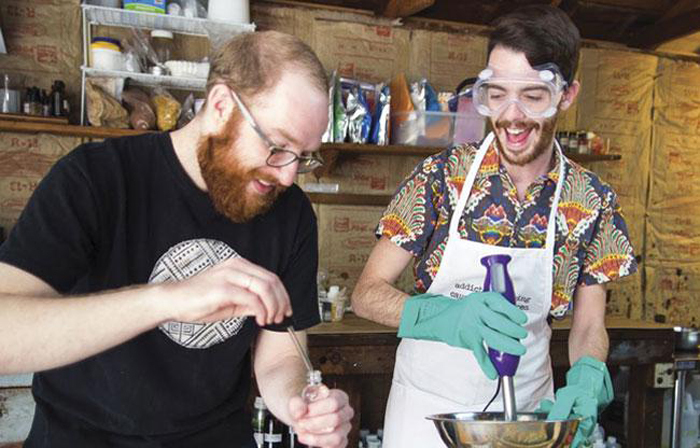 Read on to learn more about Kevin and his soapy business, along with his tips for creating YouTube videos. 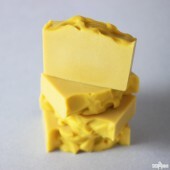 -A.M.
A collection of Kevin’s cold process soap. I’ve only been soaping for a little over two years. 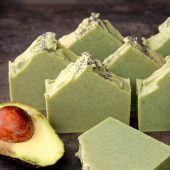 I was just surfing the net one day and somehow landed on watching a YouTube video of making homemade soap…and I was completely hooked from that moment on. 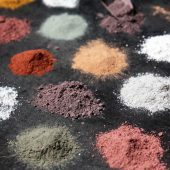 I think I would give two pieces of advice: One, be clear about your goals – are you a hobbyist who wants to sell a little to support your soapy addiction (like me), or are you planning to make this a second or even a primary income? Those are very different things and need different kinds of approaches. Included with that one is deciding if you really want a business at all. If turning the hobby you love into a business makes you hate it, then think long and hard before you make that leap. Second, I would say be prepared to work hard and probably not see big (if any) returns for at least a year or two. Even a small business can be a lot of work, and there’s so much to learn. You can’t just open a web store an expect tons of orders. 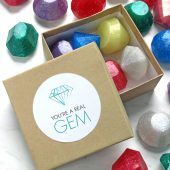 In addition to learning how to source all of your materials and organizing your work space, planning packaging and shipping, figuring out profits and losses, learning tax rules you’ll need to learn to market yourself and your product. You have to be diligent if you want to achieve those goals. 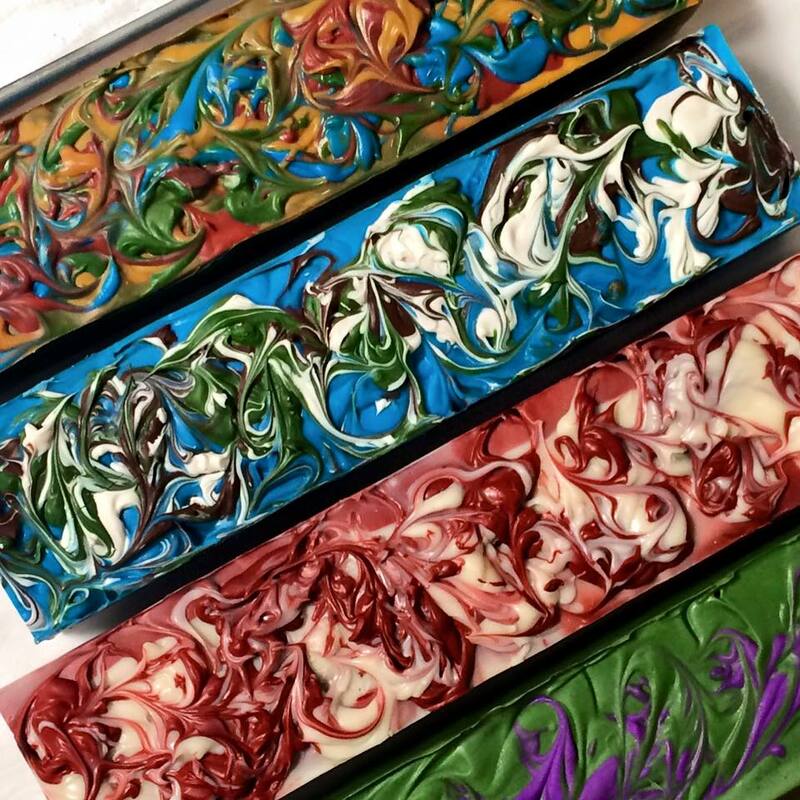 Jodi from Lakehurst Farms creates both melt and pour and cold process soap that is full of color, creative embeds and beautiful swirls. 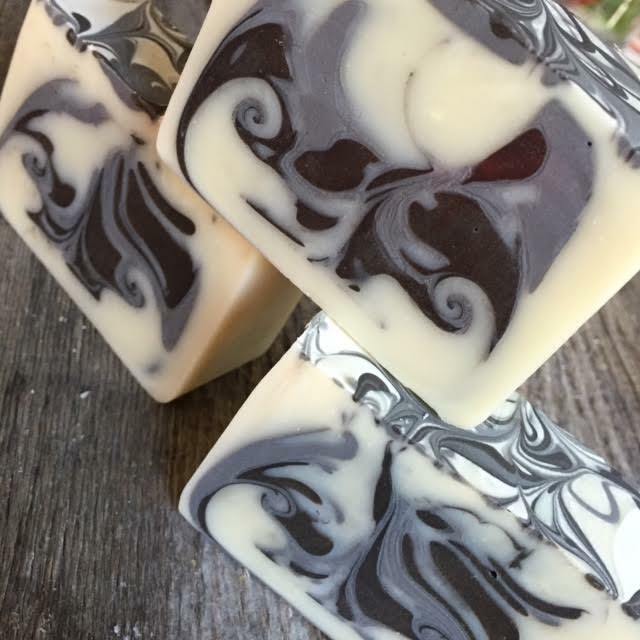 Just one look at Jodi’s soap, and you can see Jodi has a keen eye for design. 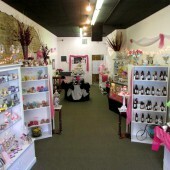 Jodi’s sister Renee also creates soap, specializing in melt and pour. Together, they are quite the dynamic soaping duo! 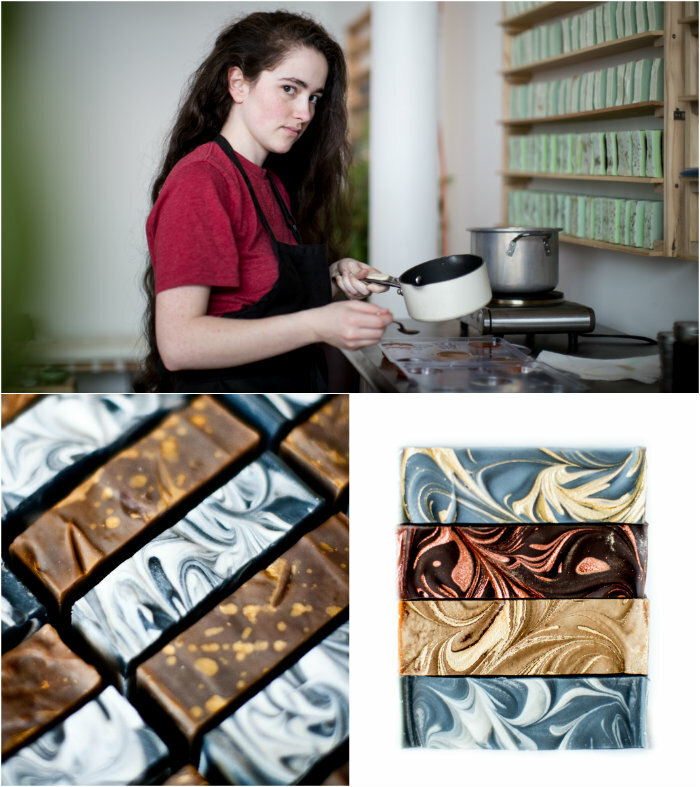 Read on to hear Jodi’s great soaping advice, along with what inspires her to create such show-stopping soap. 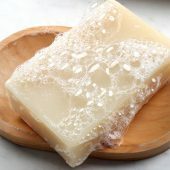 I’ve been soaping for almost two years. One day while perusing a goat supply catalogue I happened past the soaping section. I took one look at the molds and the bottles of FO and it was love at first sight.